Latkes are dangerous to make. It's Hanukkah on New York's Lower East Side in 1912. Young Gertie, who is four, is very excited about all of the preparations that her parents and four older sisters are making. Making latkes is especially intriguing, since they are made only once a year. Gertie wants to help, but the others tell her it is too dangerous and she should read her library books instead of trying to help out. Angry, she goes to the next room to hide, thinking they will be sorry they ignored her, but no one comes. Eventually, Papa comes looking for her and takes her out to the family celebration to eat the delicious latkes. 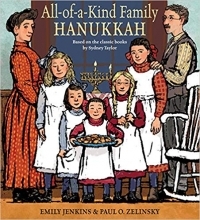 This simple story is a good introduction to the classic Sydney Taylor All-of-a-Kind Family (1951) middle grade books, which were some of the first books about Jewish children that reached a main stream audience. Today, there is a Sydney Taylor book award for contributions to Jewish children's literature. 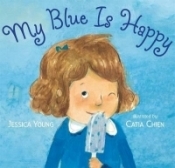 These books showcased the daily life and celebrations of a family in an immigrant neighborhood in New York City in the early 1900s and were some of my favorites when I was young-- they were sort of the equivalent of The Brady Bunch when it came to positive and fun depictions of a large family. The story is simple and easy to follow, and the notes at the back are helpful in understanding so of the concepts of the time, as well as the history of the series. Zelinsy's drawings, while vastly different from the Joe and Beth Krush illustrations in the original books with all of their fine-line details, depict the era well. The family's apartment is clearly laid out, and made sense for the first time to me-- of course it was just two rooms! The colors are happy, and the sense of movement and joy comes through the rough outlined shapes. All-of-a-Kind Hanukkah is a great addition to a collection of holiday books, and also a good way to develop an interest in a classic series. Give this one to readers who love Little House on the Prairie early reader novels, American Girl books, or historical fiction picture books.